Her you will find bags, belts, rucksacks as well radio equipment or night vision optics of the US armed forces, both from the US Army as well as the US Air Force or USMC and also US Navy. Gear There is 1 product. In this category you will find different subcategories with various backpacks and bag of the US military from different eras and materials. Here you will find helmets and accessories such as Cateye helmet bands, helmet covers, chin straps and M1 helmet liners as well as sweatbands for PASGT Kevlar helmets. We also have ACH and ECH ME helmets and helmet pads for you. In this category you will find US Army Fragmentation and Ballistic vests from different eras. Her you will find radios and accessories of the AN/PRC, GRC and RT series of the US military, such as antennas, caps, cables, headphones, handsets and much more. In this category you will find attachments and accessories for weapons of all kinds such as Claymore detonators, holsters, slings, bags, bipods, rails, cleaning kits and much more. In this category you will find everything that will help you in the battle, such as bags, lamps, glasses, vests, harnesses, gas masks and all sorts of accessories. Everything that could be useful to a soldier can be found here. In this category you will find everything that has to do with optics such as target devices, binoculars, spotting scopes or even night vision devices. Her you will find everything you need in the field rations, care products, camp beds and much more. No matter what your mission looks like, whether they are enlighteners on their own or in company strength, in rough terrain or in the camp when it improves their lives in use, simplifies them or makes them more comfortable, they will find it here. 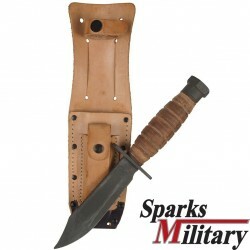 US MilitaryOntario 499 Survival knife with saw backNSN 7340-00-098-4327 Manufactured by OntarioMade in USAFree For sale over 18 years, proof of age required!